American teenagers remain generally upbeat about social media, saying it helps them feel included and connected, despite persistent problems of social pressure and bullying, a study showed Wednesday. The Pew Research Center report found a strong majority of the 13- to 17-year-olds had positive rather than negative feelings about their social media experiences. The nationally representative survey found 81 percent of teens said social media makes them feel more connected to their friends. And 97 percent said they used at least one of the seven major online platforms that were queried in the survey. 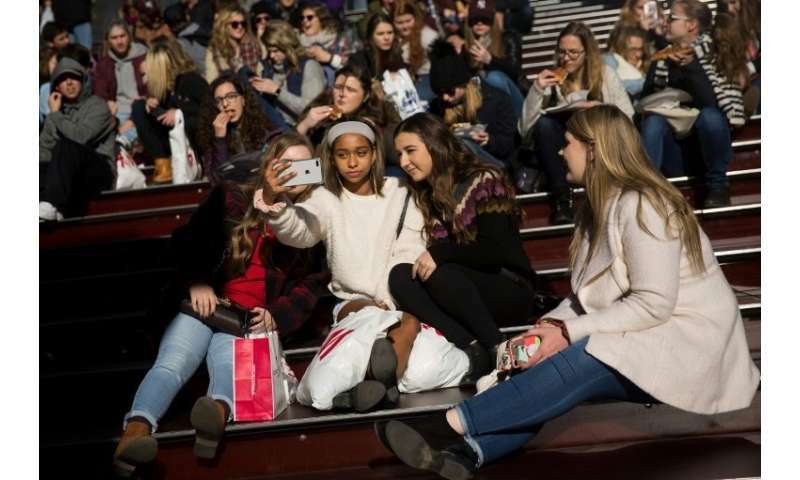 More teens —71 percent to 25 percent—said that social media makes them feel included rather than excluded, confident rather than insecure (69 to 26 percent), authentic rather than fake (64 to 33 percent) and outgoing rather than reserved (61 to 34 percent). Still, 45 percent of teens say they feel overwhelmed by the "drama" on social media. Among those who have disconnected, more than three-fourths cited excessive "drama." Some 43 percent said they feel pressure to only post content that makes them look good to others. The survey did not ask about experiences with specific social networks but included data confirming that Facebook had been overtaken by rivals as the most popular social media application. It found Facebook-owned Instagram used by 72 percent of the teens, with Snapchat at 69 percent and Facebook 51 percent. Twitter was used by 32 percent.